100% Hand Oil Painting on canvas. Oil painting. regular item. To other country. Special instructions. special item. With Framed,Alec Monopoly Portrait on Canvas Urban art Peter pan The duck 24x32"
Materials/Milieu: 100% Hand Painted BY Artist with oil paint on real Canvas. Don?t have any negative and neutral evaluation when you leave. We will do our best to resolve the problem. New Design! Alec Monopoly Handcraft HUGE Oil Painting on Canvas,Portrait 24x36"
Materials/Milieu: 100% Hand Painted BY Artist with oil paint on real Canvas. New Design! 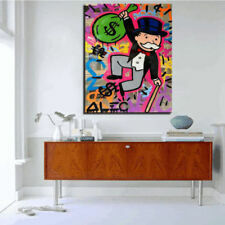 Alec Monopoly Handcraft HUGE Oil Painting on Canvas Portrait ,24×32"
New Design! Alec Monopoly Handcraft HUGE Oil Painting on Canvas,Portrait 24x30"
Alec Monopoly Oil Painting on Canvas Urban art wall decor 2PAC Portrait 28x28"
Alec Monopoly Oil Painting on Canvas Urban art 2PAC Portrait 28x28" Item Specification ---Oil painting on canvas ---Urban / Graffiti art ---Unframed ---Additional 5cm white edge ---Rolled in a tube For additional sizes please contact us Terms Of Sale 1--We accept only Paypal 2--30 days money back guarentee 3--If you are not satisfied for any reason please contact us Shipping Information 1. Item will be shipped within 2-3 days after received a verified payment 2. All items are shipped from China post/ Hong kong post/ePacket 3. Shipped by air mail which normally takes 10-25 working days for arrival (for most regions excluding Russia, Belgium,France,Germany.Sweden) 4. Import duties,taxes&charges are not included in the item price these are buyers responsibility 5. We ship Wordlwide with tracking number provided. Also note that monitor settings may vary from computer to computer and may distort actual colors. Artist ： leader Class in art room. Notes: low Starting price just for Promotions. Materials 100% Hand Oil Painting on canvas. Or negative. you give us neutral. We maintain high standards of excellence. Also note that monitor settings may vary from computer to computer and may distort actual colors. Notes: low Starting price just for Promotions. You give us neutral. We maintain high standards of excellence. Also note that monitor settings may vary from computer to computer and may distort actual colors. Notes: low Starting price just for Promotions. Condition: Good. Region of origin: China. Artist ： leader Class in art room. Product introduction. you give us neutral. Also note that monitor settings may vary from computer to computer and may distort actual colors. Notes: low Starting price just for Promotions. Alec Monopoly Oil Painting on Canvas Urban art decor Rapper Portrait 28x40"
Alec Monopoly Oil Painting on Canvas Rapper Portrait 28x40" Item Specification ---Oil painting on canvas ---Urban / Graffiti art ---Unframed ---Additional 5cm white edge ---Rolled in a tube For additional sizes please contact us Terms Of Sale 1--We accept only Paypal 2--30 days money back guarentee 3--If you are not satisfied for any reason please contact us Shipping Information 1. Item will be shipped within 2-3 days after received a verified payment 2. All items are shipped from China post/ Hong kong post/ePacket 3. Shipped by air mail which normally takes 10-25 working days for arrival (for most regions excluding Russia, Belgium,France,Germany.Sweden) 4. Import duties,taxes&charges are not included in the item price these are buyers responsibility 5. We ship Wordlwide with tracking number provided. Alec Monopoly Oil Painting on Canvas graffiti art Salvador Dali Portrait 28x36"
100% hand-painted high quality Oil paintings by professional artist on canvas. pictures shown on website caused by many factors such as brightness of your monitor and light brightness. hope to get your understand ! Materials 100% Hand Oil Painting on canvas. Don’t have any negative and neutral evaluation when you leave. Artist ： leader Class in art room. or negative. you give us neutral. We maintain high standards of excellence. Also note that monitor settings may vary from computer to computer and may distort actual colors. Artist ： leader Class in art room. Product introduction. you give us neutral. We maintain high standards of excellence. Also note that monitor settings may vary from computer to computer and may distort actual colors. 100% hand-made oil painting on canvas. Of course, we will try our best to paint a good painting.